Hummus is one of the more popular Middle Eastern dips. 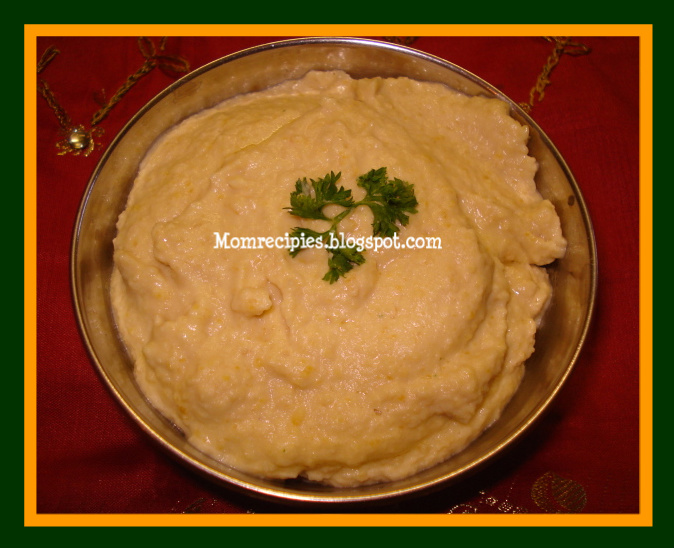 This home made hummus is is high in iron and vitamin C .It can be served with fresh or toasted pita bread or other bread .Hummus can be served as dip with snack or appetizer. Tahini is an important part of the hummus recipe and cannot be substituted. However, it can be omitted.Hummus freezes well for up to 6 months ,so you can always have it on hand. Kids also love this savory spread . 1) Place dried chickpeas in a bowl, covering with cold water. Allow to soak overnight. Omit this step if using canned beans. 2) Drain chickpeas and set aside liquid from can. 3) In a blender or food processor, combine the chickpeas and 1 /4 cup of water or .Puree until smooth. 4) Then add remaining ingredients in blender olive oil ,garlic, tahini ,salt.Cut the lemon in half and add the juice from one half.Blend for 3-5 minutes on low until thoroughly mixed and smooth. Taste and adjust the flavor and consistency with more lemon juice and olive oil. 5) Transfer into serving bowl, and create a shallow well in the center of the hummus. 6) Add a small amount (1-2 tablespoons) of olive oil in the well. Garnish with chopped parsley (optional). Serve immediately with fresh, warm or toasted pita bread ,Falafel . For a spicier hummus, add a sliced red chilli or a dash of cayenne pepper or paprika. To store, refrigerate in an air tight container for upto 1 week . If you want to store up to 6 months then spoon into ice cube trays or other freezer containers and freeze covered. Add a little olive oil if it appears to be too dry.